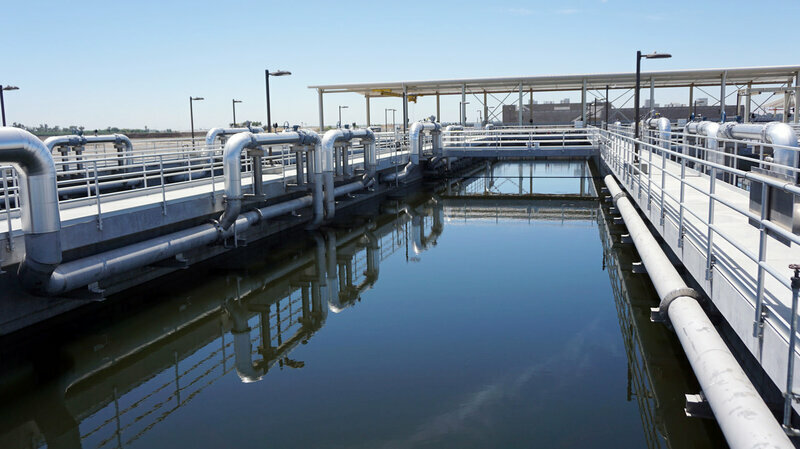 The city of Modesto’s wastewater treatment plant could supply millions of gallons of water to local farmers in California. Many California farmers are in a tight spot this summer, because their normal water supplies have dried up with the state’s extreme drought. In the state’s Central Valley, that’s driving some farmers to get creative: They’re looking at buying water from cities — not freshwater, but water that’s already gone down the drain. The parched conditions in the valley, the state’s farming hub, have been crazy. Actually, “crazy wouldn’t adequately describe what we’re going through here,” says Anthea Hansen, who runs the Del Puerto Water District in the Central Valley. “Having zero water available — we’ve been in survival and crisis mode for literally 24 months now,” she says. The evidence is right across the street from her office: a 350-acre farm field. “This land would typically be farmed in probably tomatoes,” she says. Instead, the field is empty. Like a quarter of the 45,000 acres in the district, it’s fallowed because there’s no water. And that’s Hansen’s problem. As head of the Central Valley water district, it’s her job to find water for this farm and 150 others. The normal supply from federal reservoirs has been cut off. There isn’t much groundwater to pump. Hansen has been buying water on the open market, but prices have gone through the roof. What her district needs, she says, is a reliable supply — something that’s there, drought or no drought. So her district turned its sights toward the wastewater treatment plant in Modesto, Calif., just a stone’s throw from some of the driest agricultural areas in the state. 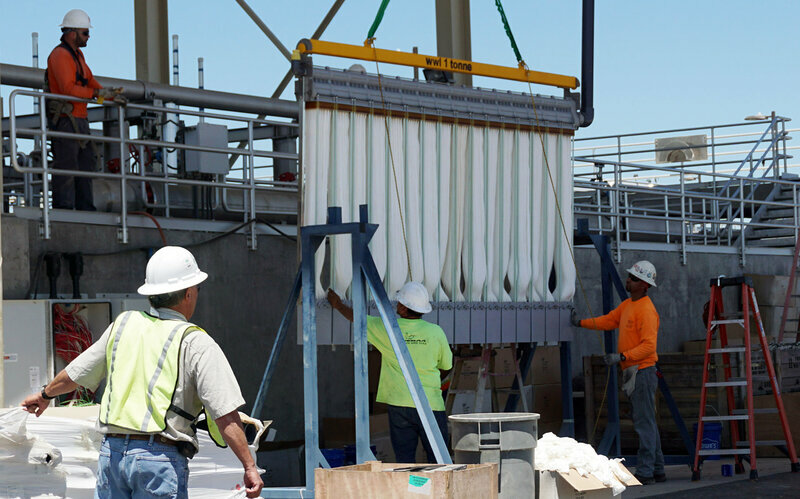 Workers install new water treatment equipment at the Modesto wastewater treatment plant, part of a $150 million upgrade. And that water will be disinfected with ultraviolet light once new equipment is installed — part of a $150 million upgrade to meet new water quality requirements. It won’t be drinking-water quality, but according to state standards, it will be clean enough to use on crops. Normally, the wastewater would be disposed of in a local river, as much as 14 million gallons a day. But Modesto had an idea: Maybe someone else would want to buy it. “Del Puerto Water District raised their hand, as quickly as we brought the question up,” Wong says. The plan is to build a 6-mile, $100 million pipeline to carry the wastewater to a canal that goes to local farms. Called the North Valley Regional Recycled Water Program, it would be the largest water recycling project of its kind in the state. And it won’t be cheap. Farmers would pay four to five times normal water prices, but growers like Jim Jasper are more than willing to pay. “I like to be optimistic, but without something like this, the future for my son and grandson and family — we’re into this third generation — I don’t know if we can keep our business going,” Jasper says. The water would meet about one-third of the water district’s “hardened” demand, or the minimal supply it can get by on. And other agricultural areas are taking notice as they face their own drought shortfalls. “There’s absolutely more potential for recycled water use in California,” says Heather Cooley of the Pacific Institute, a nonprofit water think tank based in Oakland. She says California could be using two to three times more recycled water. But there are also potential problems. For one, keeping wastewater out of a river could impact the river itself. That’s the case for Modesto. Farmers in a nearby water district are protesting the plan. They’re worried it will reduce the flow of a local river. Recycled wastewater projects are currently used in Monterey and Sonoma counties, where urban areas are close to farm fields. But in other parts of California’s Central Valley, Cooley says, location is a problem. It’s expensive to move wastewater long distances, and a lot of farms are just too far from big cities and all their wastewater. “It’s not the single silver bullet solution for agriculture. Agriculture is going to have to do a lot of things to adapt to a future of less water availability,” she says. In the Del Puerto Water District, farmers see water recycling as a way to survive that future. The project still needs a slew of permits from the state, but if all goes well, the taps could open up in just three years. As the California drought continues, residents are being back to cut back their use of water by 20 percent. One way to do that is to use greywater — recycled water from showers, sinks, and washing machines. But even though the state allows homeowners to install their own recycled water capture systems, there are some obstacles to the process. Gradiant’s 12,000-barrel-per-day, carrier gas extraction plant (shown here), uses a humidification and dehumidification (HDH) technique that heats produced water into vapor, and condenses it back into water, without contaminants. This yields freshwater and saturated brine, commonly used in drilling and completion processes. Hydraulic fracturing, or “fracking,” produces a lot of wastewater. Drilling one well requires millions of gallons of water that’s injected into the ground to loosen rocks and release oil. While some is reused, much of the produced water is discarded into deep injection wells, and clean water is purchased again and again. But MIT spinout Gradiant Corporation is working toward making fracking a water-neutral process, by making water reuse more economical. Founded by Anurag Bajpayee SM ’08, PhD ’12, and Prakash Govindan PhD ’12, Gradiant has developed cost-effective systems to treat briny oilfield water for reuse, saving millions of gallons of water — and millions of dollars — annually. Launched in 2012 with help from MIT’s industry-connected ecosystem, Gradiant has erected two 12,000-barrel-per-day plants in the Permian Basin of Texas, partnering with two drilling clients who treat about 10,000 barrels daily there. “That’s 10,000 barrels a day they’re not disposing of, and 10,000 they’re not buying from the city or taking off the public water supply,” says Bajpayee, now Gradiant’s CEO. The plants each use separate technologies that treat varying infeed water, which can be adjusted to customer specifications. Carrier gas extraction (CGE), a humidification and dehumidification (HDH) technique developed by the Gradiant co-founders at MIT, heats produced water into vapor, and condenses it back into water, without contaminants. This yields freshwater and saturated brine, commonly used in drilling and completion processes. Selective chemical extraction (SCE) is a cost-effective version of standard chemical-precipitation techniques — where chemical reactions remove specific contaminants to produce clean brine. Both systems employ custom control algorithms that minimize operator intervention and chemical consumption, while continuously adjusting the process to account for varying feed water quality. Thanks to several design innovations, these systems can treat water with higher levels of contamination using less energy and at lower costs than competing treatment methods, according to Gradiant. Reverse osmosis, for example, treats water with a maximum contamination level of around 7 percent, while legacy thermal desalination reaches about 20 to 22 percent. But Gradiant’s technology uses even less energy to treat water beyond 25 percent, broadening the range of water that can be treated, Bajpayee says. “Our technology is unique in its capability of going through true saturation limits … to the point where you can actually start seeing crystals in the water,” he says. HDH is a decades-old concept: Water is vaporized and condensed on a cold metallic surface to remove salts. But commercial-scale systems have always been too energy-intensive, because water must be boiled while condensing surfaces must be kept very cold. But Gradiant’s system — designed by Govindan and colleagues in the lab of Gradiant co-founder John H. Lienhard, the Abdul Latif Jameel World Water and Food Security Professor at MIT — scaled well by using a readily available carrier gas (dry air) that vaporizes water below boiling temperatures, and incorporating a column with microbubbles that optimizes condensing surfaces. In the Gradiant system’s humidifier chamber, briny water drops through packing material and mixes with dry air to produce a hot and humid vapor stripped of contaminants — such as salts — that forms at the top of the chamber. “We creatively mimic nature’s rain cycle — we create the cloud and then we condense that water back out to create rain,” Bajpayee says. This “raining” happens in a bubble column, which has several levels of perforated trays, each containing a shallow pool of freshwater. As vapor rises through the bubble column, it passes through the plates’ holes, causing an extremely rapid mixing process that cools and condenses the water within the pools. As levels rise, the water overflows and is captured in a tray as fresh, nearly distilled water. The temperature difference between the warm and cool water is much less than in a conventional dehumidifying system, using less energy, and the surface area provided by the microbubbles in the trays offers a more efficient heat-transfer ratio than a flat, metallic condenser surface. Not using expensive materials, such as titanium, in the heat exchanger also reduces the capital costs. Heated water is also reused to preheat incoming feed water. Instead of fully heating the incoming water to the desired temperature, Bajpayee says, “you only have to make up the little bit that you couldn’t recover,” which saves energy. Indeed, Bajpayee and Govindan met in the late 2000s while working on separate water-treatment technologies in MIT’s Rohsenow Kendall Heat Transfer Laboratory. The oil and gas industry were then heavily investing in fracking, leading to outcries about wastewater. Soon, Bajpayee teamed with Govindan on the system, and they began reaching out to different industries — oil and gas, leather, and power plants — for feedback. “Because we wanted to see the societal and commercial impact of our work, we started seeing what was happening in the industry, and then started … asking them how to solve their problems,” Bajpayee says. That’s why in two years the startup has managed to build two plants, and commercialize two product lines. It also has three additional water-treatment technologies — one based on Bajpayee’s PhD thesis — under development that could be commercialized in the next two years. Although Gradiant’s first market is the oil industry, it plans to introduce its technologies to different industries across the globe — wherever there’s incentive to recycle highly contaminated water, according to the company.